Recommended for : Dedicated Jaejoong fans or rock enthusiasts. NOT recommended for : Listeners who do not fancy heavy instrumentals and depressing ballads. Active soldier JYJ’s Jaejoong unleashes his inner rock god in his second solo album, No. X.
Jaejoong showcases his versatile musical tastes and abilities in this album, which has both pop rock numbers and ballads. This song is a cheerful jam, one that will make mornings fresher. The song begins with a catchy guitar riff, accompanied by Jaejoong’s lively tone. Jaejoong shows glimpses of vocal power in the chorus. The electric guitar and drums also begin to up the tempo. A heavy, grunge-like guitar solo leads into the second verse, which is a repeat of the first. The second chorus already drills the line, ‘Good Morning Night’ into our minds. In the bridge, the tempo slows down as Jaejoong’s crooning puts us to bed. There’s a bout of auto-tune before the song finishes with the final chorus. Drawer is a sweet ballad. There isn’t much straining going on, as the notes are in his comfort zone. A soft acoustic guitar tune blends in with Jaejoong’s raw emotions in the first verse. The section leading to the chorus builds into a faster tempo. Jaejoong’s tone becomes more desperate in the chorus and it matches well with slow drumbeat. The second verse is a repeat. The bridge features an electric guitar solo, which oozes out a longing feel. In the last chorus, that’s where Jaejoong blesses our ears with a powerful belt. The song concludes with his breathy adlibs tugging onto the heartstrings. It’s a catchy pop-rock number, reflective of a band’s front man giving all of his energy at a concert. The quick beat is both addicting and head-bang worthy. In the chorus, Jaejoong uses his falsetto and snazzy diction to fit the rock style. Things slow down in the middle of the second verse, which raises the anticipation for more explosive vocals. A whole new change enters in the bridge. Jaejoong adopts a nasally sing-rap as the beat drops before a couple of nice belts. The epic adlibs once again takes the song to its biggest heights in the last chorus. This is arguably the better half of the ‘Love You’ combo. Love You To Death is a medium-tempo ballad where Jaejoong’s true vocals shine the most. A bittersweet piano sound begins the song, which matches well with Jaejoong’s gloomy tone. The line, “I miss you, I hate you, I love you” basically sets the theme of the song. A mixture of guitar, synthesizer and drums create a calming yet heart aching beat in the chorus. Second chorus, is similar to the first except for a change-up towards the end where Jaejoong changes the key and produces a few resonant belts. The highlight bridge is simply beautiful as Jaejoong takes our breath away with a chain of bright and powerful notes. The line, “Not even close” lures us into a lonely corner. Jaejoong’s fragile tone in the last chorus makes the eyes water. Overall, it’s a simple song executed to perfection. This track is vastly different to the B2ST equivalent. It’s a very heavy metal centric from the get go, as the electric guitar and drums form a fast, head-banging beat. Jaejoong tries to sing with grunt from the first verse to the chorus. However, the slight playfulness fails to raise excitement levels. He’s got some tongue tension and whininess here, which isn’t very pleasant to the ears. The bridge is somewhat better, as the beat drops from a sprint to a jog. But there is no change-up in the last chorus. The song ends with another guitar solo that would only be a visual spectacle if Jaejoong tried playing it. A funky, electronica-inspired intro kick starts the track. Once Jaejoong begins to sing with a mellow tone, the song turns into a rock ballad. The smooth tune resembles a typical break-up song. Feisty diction in the chorus fits the angst of the song. In the second verse, Jaejoong mixes things up by throwing in a few high notes. Jaejoong adds more adlibs into the second chorus. A sad guitar solo follows a booming start to the bridge where Jaejoong sustains a few belts. The last chorus has nicer adlibs than the previous, but sounds pretty pushed. This is a Fall Out Boy esque, punk-rock song. The song begins with a fresh, lively feel. It’s like Jaejoong is telling a story about his whacky side. The chorus is very catchy, highlighted by fast-paced instrumental and nice vocal runs. Second verse is a repeat. In the bridge, Jaejoong softens his voice to compliment the acoustic accompaniment. The line, “I’m fine” is where Jaejoong explodes into another powerful chorus. The acoustic guitar intro blends well with Jaejoong’s nasal tone. There’s a longing feel to the song, especially in the chorus. The second verse stays true to the slow tempo. After a quick guitar solo, Jaejoong desperately yearns for his girl in the bridge, expressing “All I need is you.” The ending chorus finishes in a pleasant manner. A piano and electronica intro forms a dark aura to the song. The first verse adopts a slightly alternative style. It builds toward a gripping, powerful chorus where Jaejoong uses his resonance and falsetto to capture the sad feel to the song. The hard-hitting instrumental continues in the second verse. In the bridge, his vocals turn up the intensity through an emotion-filled vocal run. Strings come in the last chorus to replace the piano, building to the climax. The song ends with all the sounds getting drowned out to a stop. This song is a classic ballad that is reminiscent of Jaejoong’s OST’s. First verse begins with a saddening piano tune accompanied by Jaejoong’s lower notes. He utilises his rich mid range to lead into the chorus. The chorus is simply beautiful, as his breathy touch brings a tear to the eye. Strings enter the second verse and fit in nicely with the piano. Jaejoong sings with desperation in the bridge before bringing the song to a tragically sad end. It is a really cute medium-tempo song that’s perfect for a lazy morning. Jaejoong sings like a lost boy here. 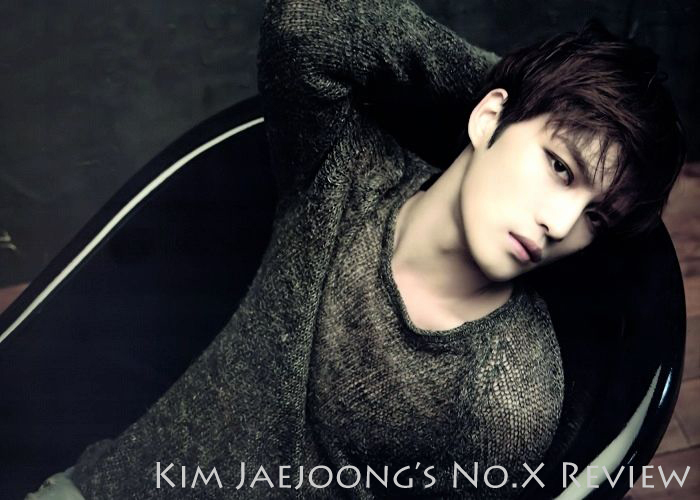 The chorus features a sweet instrumental, accompanying Jaejoong’s comfortable vocals. He refreshes the ears in the second verse, thanks to clear and simple diction. In the highlight bridge, Jaejoong’s tone becomes a bit mellow but doesn’t try to over-sing. The song ends as calmly as it started. Run Away is like Jaejoong’s version of a Coldplay track. The heavy and loud piano screams ‘killer ballad’ from the get go. Jaejoong sings, “It’s the end of the world”, which creates an apocalyptic mood. Jaejoong’s devastating tone stays in the chorus. He tells a story of him and his woman being the only survivors left but he wants her to run away. The snippets of English lyrics are nice additions. The verse and chorus are repeated before Jaejoong ends the song with one last plea for his woman to ‘run away’. The best aspect of No.X is the mixture of different paced songs. Most of the songs are of a good quality with some flashes of brilliance. As a ballad admirer, I loved the slower tracks such as Drawer, Love You To Death and All The Glitters more than fast-paced numbers like Good Luck. The album showcases Jaejoong’s passion for the rock genre but I believe his cleaner vocals in ballads is more pleasant to the ears. Overall, No. X is definitely worth listening to, especially during the lonely hours of the night.